It’s Thursday during the football season and that means that it’s time for the NFL’s Thursday Night Football. There’s just one minor difference about tonight’s game between the New York Jets and the Buffalo Bills: instead of using Twitter to share sarcastic comments about how Rex Ryan is overrated, you can watch the game live via Twitter’s website and apps. As announced back in April, Twitter has secured a deal with the NFL to live-stream 10 games this season. The games will be available for free via Twitter’s website, the “Moments” tab of Twitter’s mobile apps, and via a handful of new Twitter apps just launched for the Xbox One, Amazon Fire TV, and fourth-generation Apple TV. 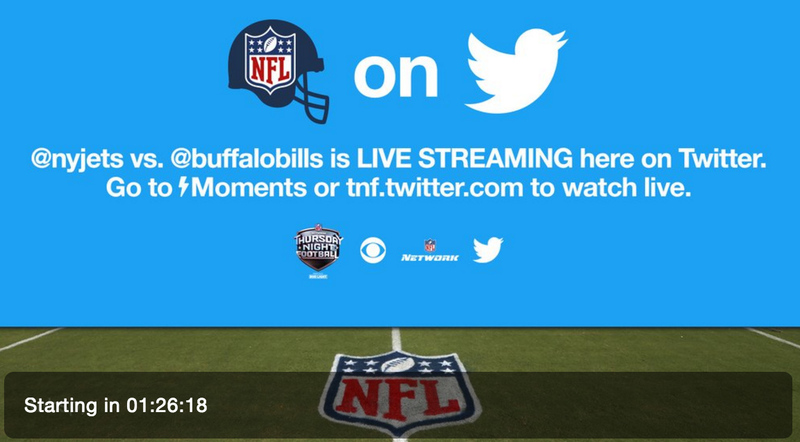 In addition to the live NFL game, viewers will see real-time tweets featuring commentary, replays, and other related content side-by-side with the video. Tonight’s game kicks off at 8:25 p.m. EDT and is available to fans worldwide except for Canada, where a restrictive deal with oppressive media giant Rogers Communications prohibits live streaming of the NFL on the Internet. There’s no cost to view the game and users don’t even need a Twitter account to enjoy the action on the Web.